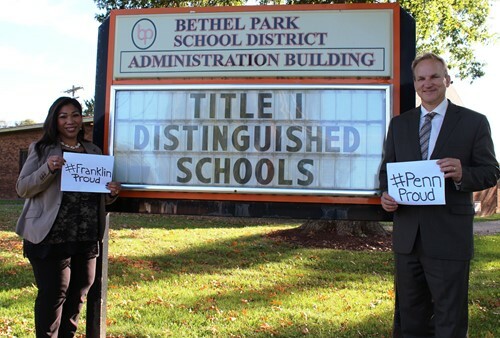 The Pennsylvania Department of Education’s Division of Federal Programs named Benjamin Franklin Elementary School and William Penn Elementary School in the Bethel Park School District as 2018-2019 Distinguished Title I Schools in the Reward: High Achievement category. They are part of a group of 158 Pennsylvania Title I schools that are among the highest 5% of Title I schools in the state, based on meeting all four Annual Measurable Objectives: Test Participation in the PSSA Mathematics and Reading Tests, Attendance Rate, Closing the Achievement Gap on the PSSA Mathematics and Reading Tests for all students, and Closing the Achievement Gap on the PSSA Mathematics and Reading Tests for historically underperforming students. Title I is a 100% federally funded supplemental educational program that provides financial assistance to local educational agencies to improve learning opportunities. Title I programs are designed to help children meet the state content and performance standards in reading, language arts and mathematics. The award will be presented at the 2019 Title I Distinguished School Ceremony in January at the Sheraton Station Square, as part of the 2019 Title I Improving Schools’ Performance Conference. Teresa Doumont is the Principal at Franklin Elementary School and Brian Lenosky is the Principal at William Penn Elementary School. Elizabeth Wells is the District’s Federal Programs Coordinator.